Chapter wo from my thesis relates to Sampling and Memory. If you want to hear the music you can go to the bands myspace page. Click on the link. John Oswald described the art in this way: “A phonograph in the hands of a ‘hiphop/scratch’ artist who plays a record like an electronic washboard with phonographic needle as a plectrum, produces sounds which are unique and not reproduced — the record player becomes a musical instrument.” (in Cox and Warner 2004, 132). The choice of a turntablist DJ Element was ideal. He had developed a great number of technical skills through his years as a “battling” DJ but he also had a wide appreciation of art and art practice, sensitizing him to the need for collaboration. Many of the DJs I had previously worked with had developed their own sound and technique or set of DJ tricks and were unwilling to adapt to new ideas presented to them. He was a turntablist that had the capacity to develop new techniques depending on the sounds required from him. Many DJs develop a personalized library of sound sources and are reluctant to move beyond them. These sample libraries are comparable to the collection of “licks” used by jazz musicians. The escalators project required a DJ that would bring his own library but would be willing to add to it on my request. DJ Element was perfect for this role. We spoke at length about the differing sounds required. For a number of years now, I have been creating music that is reliant on digital samples, both in a live context and studio context. Katz defines digital sampling as “ a type of computer synthesis in which sound is rendered into data, data that in turn comprise instructions for reconstructing into sound. Sampling is typically regarded as a type of musical quotation, usually of one pop song by another, but it encompasses the digital incorporation of any prerecorded sound into a new recorded work” (Katz 1970, 138). The sampler as a machine has a long history that started with the Singing Keyboard made in 1936, a machine intended to store sounds that could be linked to film, as well as the Noisegraph, the Dramagraph, the Kinematophone, the Soundograph and the Excelsior Sound Effect Cabinet, all machines that employed some sort of disk or other mechanism to store various sound effects and were all put to work in the Hollywood cartoon tape editing techniques developed by film editors (Chanan 1995, 143). Appropriating hundreds of bits and pieces of other peoples work to generate new sounds by remixing them is a technique very common in the hip-hop community. This includes artists such as DJ Shadow who released a seminal sample based album entitled Endtroducing (1995). However, prior to that it is a technique used widely by composers such as Pierre Schaeffer with his musique concrete compositions of the 1950s, Gavin Bryars in his piece Plus Minus which incorporates a collage of the slow movement of Schubert’s C Major String Quartet and Barry Ryon’s pop song Eloise (1969) as well as John Oswald’s seminal recordings entitled Plunder phonics (1989). My interest in sample-based music arose from my work with Des Peres, a Melbourne based band in which I participate as composer and leader. Des Peres recorded and released a number of albums that are either sample heavy or entirely created using samples which have been garnered from my own and others record collections. Sampled based music is a music that allows for great freedom. A composer can take sounds from anywhere, mix them together and then apply their own touch. The restriction of the samples themselves is offset by the manipulated recontextualisation that can take place. It is a form of music that ignores the rules of genre. Rather it leads to the creation of new genres. Style is placed upon style, classical is placed upon rock beats, folk or country is placed all over jazz drumming, fusion bass lines are interspersed with blues guitar and its all mixed together. The main limitations with what might happen, is the creativity of the composer. One’s limits usually stem from ones imagination rather than one’s talent. It is an idea that seems to build on the statements made by Cage with his piece Imaginary Landscape (1939). His composition consisted of chance recontextualisations using turntables and radios. In his famous essay, “Experimental Music” he says, “Any sound may occur in any combination and in any continuity.” For Cage the sounds of one environment were meant to be taken out of context and shifted through many new ones. 1. what takes place in perception when a person hears a sample? 2. what is happening within a persons memory when sounds that are familiar to them are recontextualized? 3. whenever a turntablist or sampler is used in music are they making a direct correlation to a human memory? The primary sound source for the instrument is past recordings. These recordings are chosen because of the direct link they have to memory makeup of both the performer (turntablist) and the listener. Paul D Miller states “DJ culture is all about recombinant potential. It has as a central feature a eugenics of the imagination. Each and every source sample is fragmented and bereft of prior meaning – kind of like a future without a past. The samples are given meaning only when re-presented in the assemblage of the mix” (in Cox and Warner 2004, 349-350). The meaning held in memory is being remixed, changed, altered, made new, given new meaning, bettered or worsened. Furthermore, Miller “considers sample mixes to be mood sculptures operating in a recombinant fashion. Based on the notion that all sonic material can be manipulated with the same ease that computers now generate composite images, the DJ or sample reliant composer combines the musical expression of other musicians with their own and in the process creates a seamless flow of music. The sampler can be seen both as a custodian and questioner of aural history, constantly crashing different voices and traditions together to give a reinterpretation of history (or memory) that is a contemporary and personal commentary” (in Cox and Miller 2004, 351). The choice of the samples is always significant. This was so for The Escalators. A human memory is, in the phrase of eminent psychologist Daniel L Schachter, a “temporary constellation of activity” – a necessarily approximate excitation of neural circuits that bind a set of sensory images and semantic data into the momentary sensation of a remembered whole. These images and data are seldom the exclusive property of one particular memory. So when one hears a familiar sound, for example a two second excerpt from Madonna’s song Like a Virgin (1985), what the memory of that consists of is a set of hardwired neural connections among the pertinent regions of the brain, and a predisposition for the entire constellation to light up when any part of the circuit is stimulated. The sound of a Madonna sample acts as a trigger for the memory that is deeply rooted in each individuals life experience and acts as a kind of oral history. Each time it is heard it enforces the constellation of images and knowledge that constitute that memory and each hearing further strengthens the dendritic connections among its components, further encouraging the firing of that specific set of synapses. (Franzin 2002, 8-9) . Each human memory is deeply locked into a system of personal referencing, i.e. a network. Ken Jordon states, “Once every sound had a distinct source. A door slammed shut, a horn was blown, a guitar was strummed. Audio came from a discreet event; it was tied to a discernable action. Networked music challenges this notion by displacing sound from its origin, moving audio freely from one location to another, giving it a presence in and of itself” (in Miller and Jordon 2008, 104). Sample-based music is a form of networked music, linking into the networks of the past and creating new networks to be referenced in the future. The conditioning of each individual through genetic, cultural, religious, psychological, and linguistic information forms a separate and unique unit. These can be known because of their differences and their connections to those outside themselves. Each fragment has its own network with its own intentions, time, space and history. (David Shea Arcana p146). Sample based music connects into this idea as it is music of arrangement rather than direct invention per se. This is true for all acts of creation but sample-based music is one of the more obvious. Sample based music takes its sound sources from an original setting and then places them within a new one. It rearranges the meanings given to the original sound source based on each individuals network of understanding related to the original sound source. 3. the formal level (Snyder 2000, 3). At the echoic level the inner ear converts sound into trains of nerve impulses that represent frequency and amplitude of individual acoustic vibrations (Buser and Imbert 1992, 156-171). At this moment the data is uncategorized and raw but through processes called feature extraction and perceptual binding the data is perceptually categorized. (Bregman 1990, 213-394) ( Bharucha 1999, 413-418). These categories or events are placed into groups based on similarity and proximity. These events subsequently activate the parts of long-term memory, which are activated by similar events in the past. As Snyder states, “Called conceptual categories these long term memories comprise knowledge about the events that evoked them and consist of content usually not in conscious awareness, which must be retrieved from the unconscious” (Snyder 2000, 4). The formal level is where the music for The Escalators is attempting to work especially with regard to syntax. Syntax is sets of relations between identifiable patterns (Snyder 2004, 200). Musically that can include ideas of genre/style or expected patterns within a piece. Snyder states “primary parameters are central to the creation of syntax because they are the aspects of music by which patterns are identified and related to each other” (Snyder 2004,200). Syntax is made possible by categorisation and memory. Musical syntax consists of learned rules that generate certain types of patterns or gestures that in turn can signify specific types of musical functions. Sampling is primarily concerned with the syntax of genre. Genre or style is a syntax that depends on the perception of patterns occurring at different times as very similar or identical. Syntax depends on the perception of identity. Sampling through the means of displacement would alter a person’s syntax within their memory. Music provides a sensory experience that activates memory. Meaningful reception of a musical message depends on appropriate context in memory, a repertoire of schemas and categories that are both personally and culturally activated (Noth 1990, 176-180). In the original choice of samples made for The Escalators a statement is made. I am attempting to influence the listener to make a selection from their memory schemata that is hopefully similar to mine. I am presuming they will all be able to identify the samples from the culture from which extracted. It is through the use of memory principles such as similarity, proximity and continuity that various pattern units are marked out. As higher-level relations between basic pattern units involving long-term memory enter the picture the listener’s personal and cultural schemas begin to have an influence (Snyder 2000, 208). It is in the recontextualisation and displacement of the sample that memory sabotage occurs. 2. music that attempts to sabotage recognition and expectation by frustrating recollection and anticipation, thereby intensifying the local order of the present. Sample based music falls defiantly into the second category. The continual genre bending of the music creates a kind of anticategorisation technique that creates sounds that cannot be easily framed in the listeners memory system. The rapidly changing samples in new settings create a nuance overload where every sound is a new event and cannot be easily identified as being in the same category as the last sound/event (Snyder 2000, 236). Discontinuities are commonplace in Western art of the 20th century, from the cubist art through to the splicing techniques used in film. With The Escalators I have injected a significant number of chosen samples into the framework of the music. These samples that play with the ideas of discontinuity and recontextualisation have been sourced from the world of popular culture, things such as pop music, film soundtracks and TV bites. I have also used samples obtained from field recording. These are to be used as “Sound Markers” (Toop 2004, 94). The field recordings were of sounds such as fire, church bells, doors opening and shutting and footsteps. Each sample has preconceived meaning to most audience members. Michael Forester describes “sound markers” as certain sounds or sound conglomerates that become lodged in memory as markers of security “The sound of the family moving around the house gives me a sense of security and belonging,” sounds can exert a powerful sense of centeredness, or perhaps push a door open within a darkened mind, offering a faint sense of escape. (Toop 2004, 94). The sounds of the church bell, fire and footsteps were to be my own sound markers to be used within the framework of The Escalators. These common sounds, have meanings for every member of the audience and would provide a sense of aural security. They also could be manipulated in the context of a musical performance. What happens when these sounds are inserted into the musical performance while constantly manipulating and distorting them? A sense of the familiar shifted sideways should result. Of the piece Jesus Blood Never Fails Me Yet (1974) in which Bryars sampled the singing of an old London tramp, looped it and then composed an accompanying chamber orchestra score, he says the methodology was ‘the idea of assemblage, and taking iconic things and recycling them.’ (in Toop 2004 161). 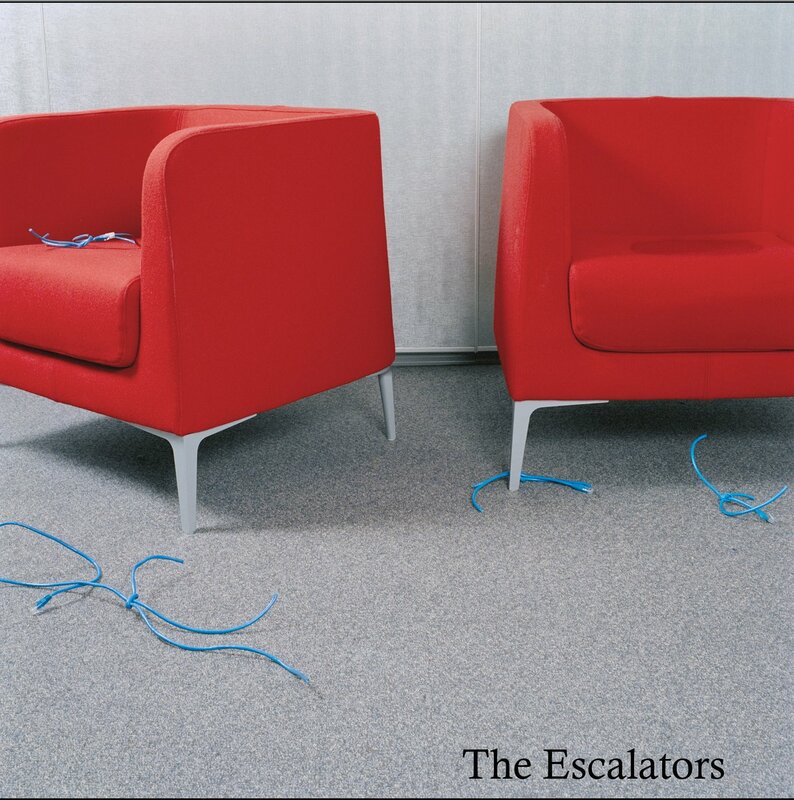 The music of The Escalators was to be always creating a sense of the familiar simultaneously always pulling the listener into a state of unease. The recontextualising of memories through sampling will naturally have this effect. Always shifting things slightly off the axis they are meant to sit on. I am in awe of the sheer length of this post dude. Awesome stuff. You in Melbourne? Me too.